There are so many questions waiting to be answered as Tampa Bay's David Price prepares to fire the first pitch of the postseason Wednesday afternoon, they even outnumber the retirement gifts outgoing Braves manager Bobby Cox received during his final tour around the league this summer. 1. Can the Rangers win a playoff series, let alone the World Series? With Cliff Lee the Rangers are positioned to win a short series. Or, a long or medium series. With Josh Hamilton's ribs having been under more ice than the North Pole during the month of September, the Rangers are positioned to get put on ice early. Hamilton slugged a home run and collected three RBI in Texas' second-to-last game Saturday after deciding that in his first couple of games back he was just trying to make contact instead of going after the pitcher's scalp. The Rangers have never won a playoff series. Not only that, check them out on BaseballReference.com and you'll see they have barely been there even when participating: The Yankees throttled them in nine of 10 total games in 1996, 1998 and 1999. Now comes Tampa Bay, where the Rangers were swept in a three-game series in August (Michael Young, Ian Kinsler and Nelson Cruz all were hurt and out of the lineup) and have lost 13 of their past 16. Lee vs. David Price in Game 1 could be priceless (not, thankfully for the Rays, Priceless). But for the Rangers, this should be easy after surviving bankruptcy court this summer, shouldn't it? 2. How much rubber cement does it take to hold together the Yankees' rotation? Contrary to rumors, manager Joe Girardi will not be managing against the Twins in a pinstriped T-shirt reading "A $200 million payroll and all I got was this lousy rotation." But this is where it starts and ends for the Yankees who have decided to leave A.J. Burnett in the station, such a train wreck has been he (10-15, 5.26 ERA). Because ace CC Sabathia cannot pitch every day, veteran lefty Andy Pettitte and young righty Phil Hugheswill follow him against the Twins. Sabathia arguably has been the Yankees' MVP this season (with apologies to Robinson Cano) given his 21 wins, 3.18 ERA and 237 2/3 innings pitched. He has carried the ball more than Frank Gifford once did for the Giants in Yankee Stadium. He thrived in his first taste of October in the Bronx last year, going 3-1 with a 1.98 ERA in five postseason starts. This traditionally is Pettitte's time of year, but at 36 and in failing health -- he missed two months with a groin strain in the season's second half -- there are questions. Like, he has allowed 10 earned runs in 13 1/3 innings since his return, and how quickly would that get the Yanks bounced? The thinking here is that he will be the most pivotal character in the Yankees' whole cast. Hughes is the wild card. "You know CC is going to be good," one veteran AL scout says. "You bank on that. But you don't know what you're going to get with Pettitte. And Phil Hughes is reaching some innings he's never gotten to before. He's a strong horse. But it doesn't look like the depth is there." 3. Is the Phillies' Roy-tation beatable? When Cole Hamels gets the ball for his Game 3 start, he'll be making history for the 2010 Phillies: He will become the first playoff starter not named Roy. Roy Halladay in Game 1 against the Reds. Roy Oswalt in Game 2. Then Hamels. Without question, the Phillies have the strongest rotation of any of the eight playoff teams. If Halladay isn't the NL Cy Young winner, the vote should be seized from the Baseball Writers Association of America and awarded to untrained monkeys. Oswalt was 7-1 with a 1.74 ERA for the Phillies after the acquired him from Houston. And Hamels, the Phillies will tell you, has been even better in 2010 than he was in 2008, when he was the World Series MVP. The trio combined to go 13-1 during the month of September. And because the Phillies recorded the NL's best record, they earned the right to choose the Division Series with an extra day off, meaning Halladay, Oswalt or Hamels will start every game against the Reds. And how will that go? 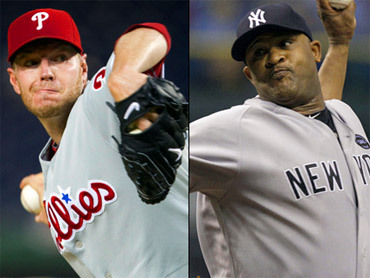 Combined, Halladay, Oswalt and Hamels are 30-4 lifetime against Cincinnati. 4. Are the Reds the team most likely to be splattered on the windshield? First, let's give the Fabulous (Dusty) Baker Boys a hero's welcome for returning to the playoffs proper for the first time since 1995. They have had a sensational, magical season. And admit it: You're thrilled to see someone supplant the joyless St. Louis Cardinals for a change this month, aren't you? Now, about this matchup with the Phillies. Did you just soak in the career numbers of Philadelphia's starters against the Reds a couple of paragraphs ago? The Reds will counter with Edinson Volquez, Bronson Arroyo and Johnny Cueto.Arroyo is the only one with any playoff experience. Playing percussion in the background and fully available out of the bullpen will be erstwhile starters Travis Wood and Homer Bailey. Hall of Fame broadcaster Marty Brennaman told me during a conversation in San Francisco in August that this Reds rotation is the best he has seen in 37 years in the booth. Problem is, while it is deep, it is not overpowering. Volquez is a very interesting choice for Game 1. Following Tommy John ligament transfer surgery in August 2009, he didn't make his 2010 debut until July 17. A former All-Star, he's 4-3 with a 4.31 ERA. One key number: Lefties are hitting only .229 against him. Philadelphia's lineup is stocked with hard-swinging lefties Ryan Howard, Chase Utley and Raul Ibanez so Volquez's numbers play very well against them. Also, we could see some titanic battles between those sluggers and Reds lefty reliever Aroldis Chapman. If the Reds can steal Game 1, maybe this gets interesting. But the bottom line is the Reds are too similar to the Phillies in that they depend on outslugging opponents. But their lineup is not as potent as Philadelphia's, and both ballparks are bandboxes. The Reds went 2-5 (0-4 in Citizens Bank Park) against the Phillies this year (and 30-41 against clubs with records of .500 or better). You see the challenge. 5. Can Tampa Bay take it to the bank while taking it out of the bank? We saw what Tampa Bay could do in 2008, and just to prove they were no one-hit wonders along the lines of Steam, the Rays won the AL East this season and have every chance of returning to (and winning) the World Series. If there is such a thing as a Team of Destiny, the Rays will do what they can to lay claim. Because this is their Last Stand: Owner Stuart Sternberg said this spring that the payroll would have to be reduced after this season, which very well could color free-agents-to-be Carl Crawford, Carlos Pena and closer Rafael Soriano gone. The payroll currently is more than $70 million, a franchise record. It might not even be $60 million in 2011. Fans in Boston and Anaheim already are dreamily fitting Crawford for virtual Red Sox and Angels uniforms. Meantime, this team has the look of one that has its act together. Maybe it was Evan Longoria continued development as the unquestioned team leader, spurred by his upbraiding of B.J. Upton during a game earlier this season for not hustling. A half-full Tropicana Field as the Rays were poised to clinch last month surely did not do much for the coffers. Hey, Tampa Bay fans, listen up: This has been one special team, and maybe you want to make sure to see them in person at least a few more times this month before, to borrow a few lines from White Sox fans, it's time to sing na na na na, hey, hey, hey, kiss them goodbye. (No. 1 on the charts in 1969 by, yes, Steam). 6. Minnesota and the Yankees yet again. Discuss. Yaaaaaawwn ... zzzzzz. Oh, 'scuse us. We just thought, with the Yankees and Twins set to begin their fourth Division Series since 2003, you know, it might be one of the only times this wall-to-wall baseball month to catch a cat nap. Well, there are indications that maybe it's time to think again. Here are the brutal facts: Since '03, the Yankees are 9-2 against Minnesota in the postseason. The Yankees have beaten the Twins in 14 of their past 16 games overall. Got to the point the Twins would often have to ask the Yankees "Mother May I?" simply to use the restrooms between innings. Here's what might make things different this time: Jason Kubel crushed a game-winning grand-slam against closer Mariano Rivera in Yankee Stadium on May 16, an emotional lift the Twins could draw from in this Division Series. The Twins have two lefty starters (Francisco Liriano and Brian Duensing) and a very deep bullpen, including lefties Brian Fuentes, Randy Flores and Jose Mijares who stand a chance at neutralizing Robinson Cano, Nick Swisher and Lance Berkman. And, maybe most important, the Twins will have home-field advantage for the first time in October. The Yankees were 5-0 against the Twins in playoff games in the Metrodome, and Target Field sure ain't the Metrodome. "You've really got to kill it to get it out of Target Field," an AL scout says. "It's the exact opposite of the Yankees' place." Target Field yielded the fourth-fewest home runs per game in baseball this summer (only Seattle's Safeco Field, the Oakland Coliseum and the Mets' Citi Field surrendered fewer). Last year, the Yankees slugged the tying and go-ahead home runs to win Game 3 in the Metrodome. In the five playoff games they've won in the Metrodome since 2003, they've slugged seven. The way Target Field has played -- and the Twins' 53-28 mark was the best home record in the AL -- that Murderers' Row of Alex Rodriguez, Mark Teixera, Cano, Swisher and Curtis Granderson might have to build rallies from the ground up, several hits at a time, rather than scoring multiple runs with one mighty swing of the bat. 7. How much will momentum play into things? The Yankees lost eight of their last 11 games. The Twins lost eight of their last 10. The Rays lost five of their last eight. The Rangers lost eight of their last 15. The Braves lost seven of their last 12. The Reds went 13-16 over their last 29. The Giants went 18-10 down the stretch. Right now, nobody is hotter than Philadelphia and San Francisco. "You look at the Rockies a few years ago, when they won 21 of 22," Giants closer Brian Wilson says. "They had momentum. Momentum has a lot to do with winning in baseball. It really does. "I like our chances. We're in the playoffs. We've got some absolute warriors. I don't think anybody wants to face us. And having three or four days off [the Giants and Atlanta are the last to open, Thursday in San Francisco], it's like another mini All-Star break. And you've seen what we've done since the All-Star break." Grading on the curve, starting only a couple days ahead of the All-Star break, the Giants' 51-30 record (.630) is the second-best in the majors, ranking only behind the Phillies' 55-27 (.670). 8. Is there anything cooler than Jason Heyward vs. Buster Posey? The votes are in. The NL Rookie of the Year award will not be announced until mid-November. But you can get a fascinating early preview as these guys go mano-a-mano as Posey's Giants face Heyward's Braves. "If Jason Heyward wins the Rookie of the Year award," one veteran National League scout says, "you're looking at some serious East Coast Bias." Heyward's supporting cast has dwindled in recent weeks, making these playoffs a serious obstacle course for the Braves as they look to send Bobby Cox out a winner. Chipper Jones (knee) is out for the season. The Braves lost the highly valuable and very underrated Martin Prado (oblique) for the season last week. Starters Jair Jurrjens and Kris Medlen have been dinged up. Takashi Saito, the Braves' top set-up man, just returned over the weekend, but he might not be on the roster for the series. The Braves ranked 13th in the NL in runs scored during the month of September, 15th in home runs and 10th in batting average. Posey's Giants, on the other hand, are surging. From Aubrey Huff's stellar season to the in-season acquisitions of Pat Burrell (who has a few revenge options this month if the Giants face Philadelphia in the NLCS or Tampa Bay in the World Series), Jose Guillen, Mike Fontenot and Cody Ross, this is a very different team than it was in April, May and June. And Posey is smack in the middle of it, batting cleanup. "What this kid has done for us, the way he's handled the staff, playing every day. Being a catcher, I know how hard that is. Not that I was ever that, but I know it's the toughest thing in ball. Your legs are worn down, and yet he was able to find a way to get through it and handle the staff and, of course hit a home run [in Sunday's clincher over the Padres]. "You talk about a catcher hitting cleanup, you think of a Johnny Bench. That's who comes to mind. You just don't see many of these guys." 9. From top to bottom, who's chasing legacies? For those of you keeping score at home, you can tell the Yankees are hunting their 28th World Series title by looking at the number on Girardi's jersey (yes, last year he was No. 27). Should they win the pennant, the Phillies will be the first NL club to win three in a row since the 1942-1944 St. Louis Cardinals. Just as the road to the World Series usually passes through the Bronx, the NL's now travels through Philadelphia. The Twins are seeking their first World Series title since Jack Morris' dazzling 1-0, 10-inning shutout of Atlanta in 1991. The Rangers and Rays have never won one. San Francisco? The Giants have never won the big trophy since moving west to San Francisco in 1958. Atlanta last won in 1995 back when Cox was still young and so was Chipper (it was Jones' rookie season), Cincinnati in 1990 back before manager Lou Piniella moved on to Seattle, Tampa Bay and, finally, the Cubs. When the Twins built Target Field without a retractable roof, everybody whined about what it might be like in October. Locals like to tell stories about how only four days after Jack Morris blanked the Braves in the classic 1-0 Game 7 of the 1991 World Series, the Twin Cities were blanketed by 28 inches of snow in a fierce blizzard. Well, here we are ... and here the Yankees are for Game 1 on Wednesday evening at 7:37 p.m. local time. Forecast for first pitch? How about 61 degrees and clear? Perfect. So bundle up -- or not -- and let's go.